Paul Belbrow from Northallerton got in touch late 2006 and asked if I knew anything about the origins of the engine he was restoring because he had an idea it was made on Dockfield Road in Shipley. I pointed him in the direction of the Industrial Museum in Bradford, the Council and a local Model Engineering Society Chairman of my acquaintance. He did the rest from there. This is his feedback with a wonderful image of the engine. 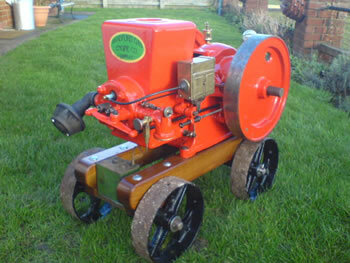 Paul writes: This is a pre 1946 Bradford enclosed crank stationary engine. Serial number 11979. It was built by The Bradford Gas Engine Co. Ltd. at Dockfield Engine Works in Shipley. The firm was also called Robson's which closed in the late 80's. The records for the firm are in the national archive and are held at Bradford records office. Hope this enlightens you to what a stationary engine looks like.